This article is linked to a webinar ' Strategic Roadmapping - take control in times of uncertainty' that was held on 19th April 2017. You can find a recording of the webinar and the presentation slides below. The article continues after the slides. The ability to plan for an uncertain future is more pressing than ever, with major changes to international trading policies as a result of recent global socio-political events - including Brexit and the new Trump administration. Challenges posed by the uncertainty surrounding emerging technology trends such as digitalisation and automation have equally far-reaching effects. The real absence of clarity surrounding such critical issues creates challenges for growth. Organisations – even those that may be regarded as industry leading – are struggling to determine how best they can position themselves and what decisions they should make in terms of their strategic investments. 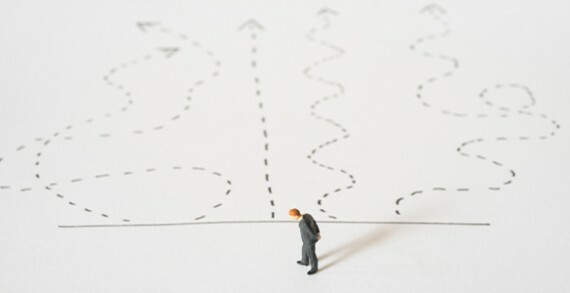 The pressure resulting from uncertainty is often most acute in senior management roles where strategic decisions that have far reaching effects and consequences need to be made. If uncertainty is not approached with the respect and structure it demands, it can paralyse their ability to make logical choices or lead to decisions that neither minimise threats nor exploit opportunities. So what can senior managers do? Organisations need to move away from traditional planning and linear forecasting tools in strategic decision-making under these uncertain conditions. These tools become inadequate in complex and evolving environments. They are generally unable to navigate uncertainty or lead to a flexible, robust and resilient strategy that helps organisations remain on the front foot and adequately respond as the yet unknown future reveals itself. Roadmapping is a planning approach that lends itself well to helping companies make sense of an uncertain outlook and to take appropriate actions. Roadmapping provides a structured ‘lens’ with which to look at a complex situation and deduce action plans. Its framework and process combine systematic planning with imagination and knowledge creation. Together, these help to interpret ambiguous situations, map out potential consequences, and take appropriate actions. The power of roadmapping lies in bringing together professionals from across an organisation to contribute insights and expertise – developing a visual narrative of the organisation's future – to arrive at an informed and shared vision. Organisations inherently have most of the required knowledge and expertise required to tackle complex situations and uncertainty, they just need a way to bring it together – roadmapping is perfectly placed to provide that platform. Roadmapping will help to clarify what the current situation (and the immediate past leading up to it) is, determine what the future situation could be (or should be, in terms of setting a vision) and maps a route from the present to the future. In achieving this, roadmapping combines various layers or levels of strategic information, both external and internal to the organisation. Such information would relate to industry, market and technology trends and drivers, as well as organisation value streams, technology capabilities and resources, for the issue under consideration. This provides a logical framework that enables decision-makers to combine different strands of information, identify relationships and dependencies and understand complex situations. Figure 1: The roadmap framework combines different layers of strategic information or viewpoints over a timeline, helping you to determine a way forward . One of the most important benefits of roadmapping is its ability to interface with other methods such as scenario planning and options thinking, which are often better suited to respond to situations of deep uncertainty head-on. Under high levels of uncertainty, where state, effect and response uncertainty all co-exist, a combination of these methods can be very helpful. With this toolset, scenario planning provides a structure to the ambiguous future or situation and helps to draw out a handful of plausible futures. Roadmapping can establish and link up necessary activities, infrastructure and resources to achieve organisational goals within each potential future, and identify commonalities and differences across them in terms of investment and resource needs. Options thinking provides direction on how an organisation can optimally position itself and manage its investment and resourcing decisions. Options thinking helps you design flexibility and contingencies into investment commitments, leaving the organisation in a robust position to avoid risks and seize opportunities that emerge as the future eventually unfolds. Figure 2: Roadmapping can integrate scenario and options thinking techniques to identify viable strategic options and investment decisions in the face of an uncertain outlook. This toolset and other adaptable roadmapping-based toolsets like it have been developed from evidenced-based research by the Institute for Manufacturing (IfM) at the University of Cambridge to help organisations develop the foresight and robust strategic plans required for uncertain and complex situations. Alignment of R&D and business objectives. Decisions informed by expert knowledge from across your organisation and agreed through discussion and collaboration. Consensus-based and transparent outcomes, owned by key stakeholders. A visual output that can be easily communicated across your organisation. IfM is a world centre of excellence for roadmapping and has helped more than 300 public and private sector organisations, including companies such as BAE Systems, BP, GKN, the Linde Group, Philips, Rexam and Rolls-Royce, with their strategic and technology innovation planning using its research-based roadmapping techniques. IfM ECS delivers a portfolio of flexible yet coherent management approaches and techniques that are customised to a company’s needs. 2. Phaal, R., Farrukh, C., Mills, J. F., & Probert, D. R. (2003). Customizing the Technology Roadmapping Approach. Paper presented at the Portalnd International Conference on Management of Engineering and Technology (PICMET), Portland, 20-24 July.